Blackjack Shark is an essential tool for any blackjack player. Are you playing with the correct basic strategy? Different casinos have different rules for blackjack, and that can affect basic strategy. Blackjack Shark contains the correct strategy for every possible set of rules. Just enter your casino's rules in the "Rules" sub-menu and Blackjack Shark will show you the correct strategy. If you want to refer to the strategy at a casino table, you can e-mail it to yourself and print it out from a computer, or you can print it out directly from the app via AirPrint. Sharpen up your basic strategy with Blackjack Shark's flash card mode. It uses the Leitner system to choose which scenarios to display, so it automatically focuses on the scenarios that you have the most difficulty with. Blackjack Shark's world-class analytical engine can calculate the house advantage for any set of rules in a matter of seconds. If you're at 16 and the dealer is showing a 10, is it REALLY that important for you to hit instead of stand? Now you can find out with Blackjack Shark's hand analyzer. Type in any scenario you want and Blackjack Shark will calculate the expected value of every possible action, instantly. Give yourself an advantage at the tables with Blackjack Shark! 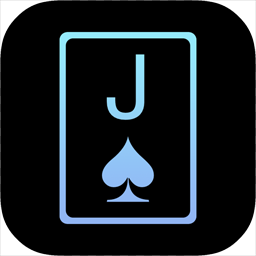 Blackjack Shark is made by the developer of tChess (the popular chess app) and Learn Chess (the Apple Staff Favorite e-book).